What I love about Tokyo is the fact that you can just show up one day and in addition to the permanent attractions, there will always be several cool events on. 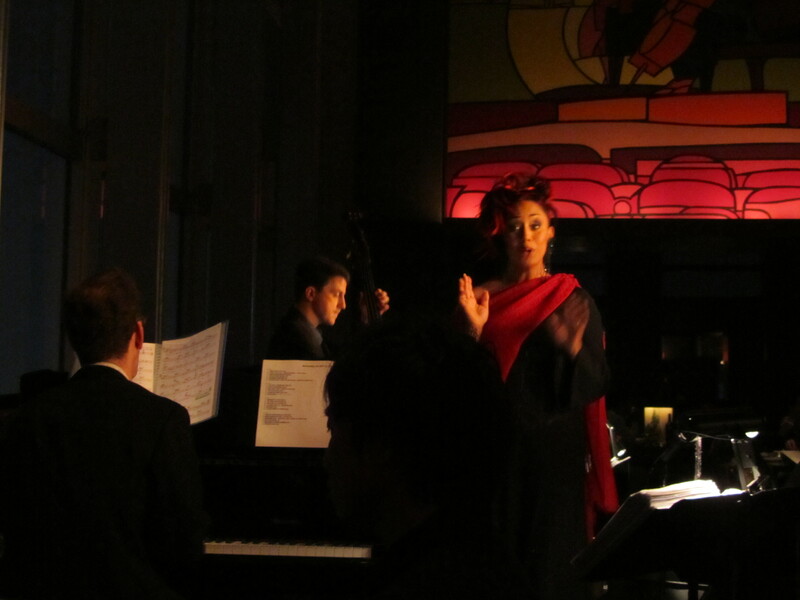 After I had gotten off the night bus and was waiting for Jenny to arrive, I checked what was on that day and saw that there was a students’ jazz festival in Yoyogi Park, and a cocktail event on in the Park Hyatt New York bar! When I met Jenny, we dropped our bags off at the hotel and then went for a wander in Ueno Park, a favourite place of mine, before going to Yoyogi Park to check out the jazz. 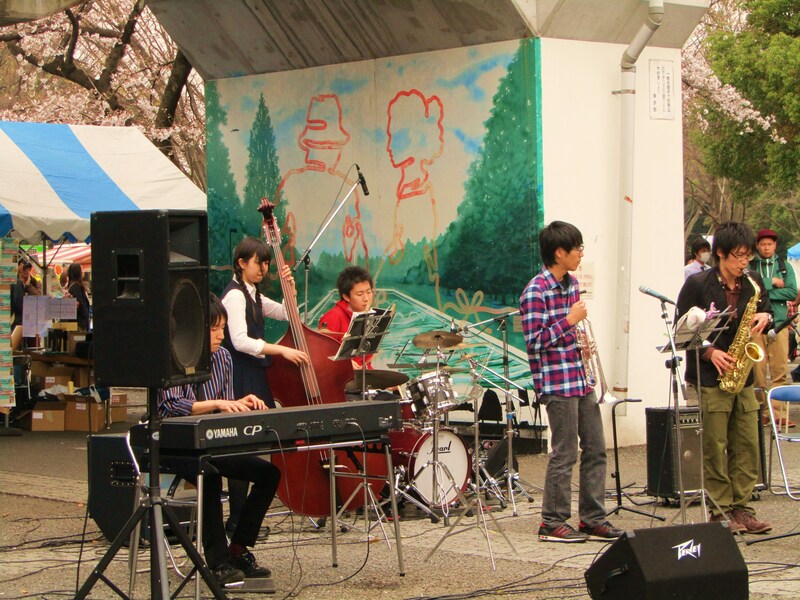 Jazz is quite big in Japan, and there are so many towns around the country that have their own jazz festivals, including my own city of Kanazawa. I don`t know why they like jazz so much, but I think most schools have music clubs and my own school has a brass band who I think are really impressive. 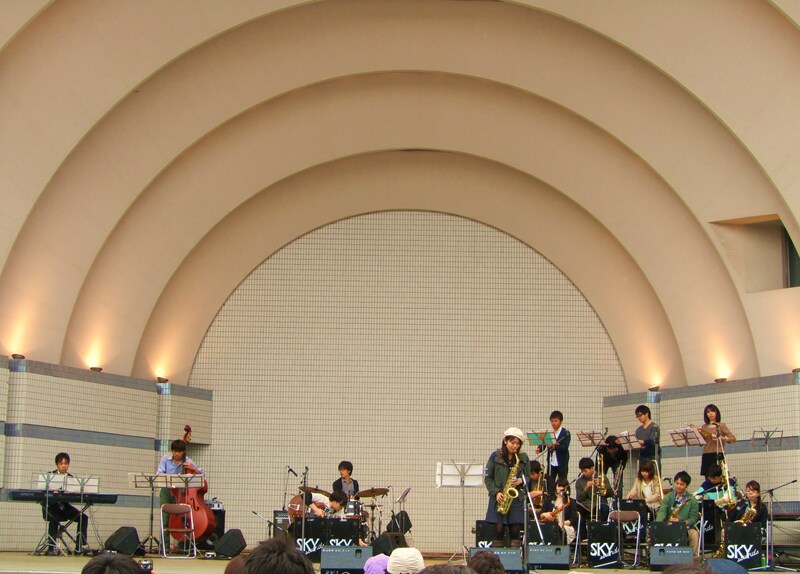 Yoyogi Park is a popular hang-out for young people, being right beside Harajuku, and this jazz festival showcased the talents of university students. 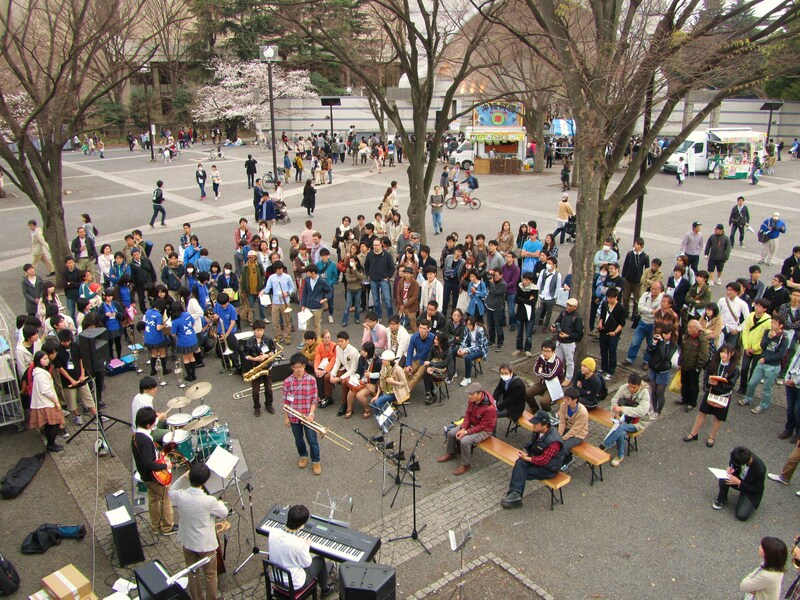 There were about three different performance spaces where different groups played, and there were the ubiquitous festival food stalls as well. With the cherry blossoms blooming, it was the perfect way to spend an afternoon. 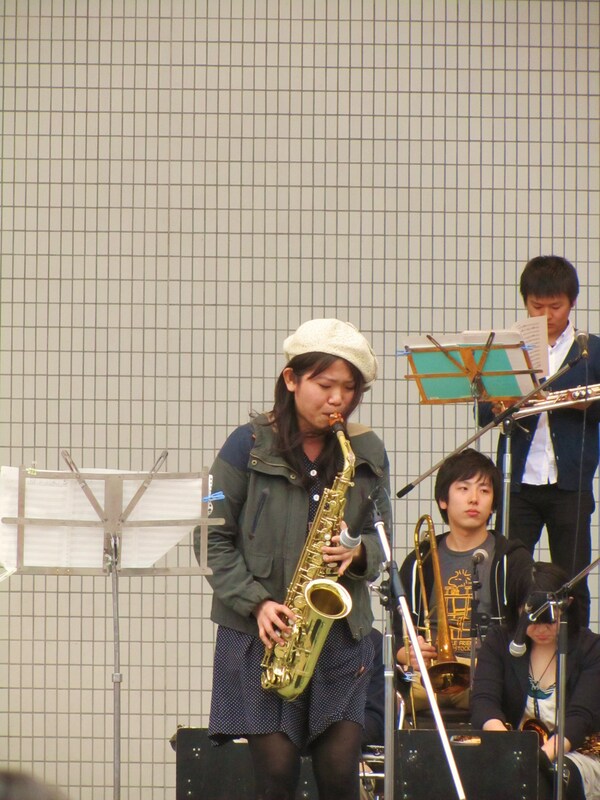 The bassist is a high-school student (hence the uniform), and hers was the most impressive solo of the group. Jenny was still running on adrenaline so we decided to spend the evening in style at the New York Bar in the Park Hyatt Hotel, Shinjuku, made famous by the film Lost in Translation. I wanted to go there because on my first night in Japan, one of my compatriots knew that we were staying close to this hotel and wanted to have a drink there. A few of us went along, being unprepared as how to find it and what it was going to be like, so we had a great misadventure getting lost wandering around the high-rises in the maze that is Shinjuku. When we got there we found out that there was a cover charge of ¥2200 (€18) which we were not willing to part with, as the yen we had brought with us had to last us til payday in a month`s time. 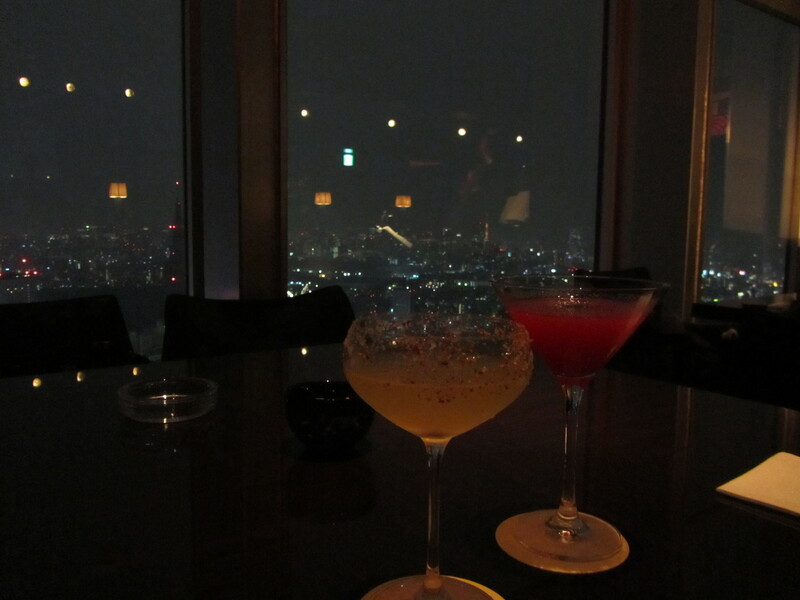 Instead, we went down to the Peak Bar, just a few floors lower which had the same menu, great views and no cover charge. But when we went in, we thought that we were going to be turned away because of the dress code, as one of our group was wearing shorts. But Japanese hospitality triumphed as they provided him with a pair of black trousers! After changing in the bathrooms, though he was still showing a lot of ankle, we sat down to enjoy an expensive drink and great night views. This time though, I had done my research and was prepared. The New York Bar was hosting ‘mixologist’ Jim Meehan from New York speakeasy PDT (Please Don’t Tell), so I thought that it would be a good time to finally visit it. I had originally planned to go early for an aperatif and to be out of there before 8 o`clock to avoid the cover charge. However, with getting the train from Yoyogi back to Ueno, getting dressed up nice (because we wanted to get into the spirit of things) and getting the train to Shinjuku, it was 8 by the time we arrived there. I had debated just going for a look and then leaving, afraid of the potential cost, but we convinced ourselves to stay for the following reasons: 1) it would be nice to experience it once, and properly 2) it was the start of our trip and we still had loads of money and we would probably be slumming it once we got to Shikoku 3) it would be my early birthday celebration. I`ve been having a great adventure lately thanks to my friend Jenny, my long-time art history friend from school and university. She has come over to Japan for four weeks to travel around and we had been planning our adventures for months. I was able to take a week off during Spring vacation and I persuaded her to spend that week off the beaten tourist track in Shikoku because I wanted to go somewhere new. Shikoku is the smallest of the four main islands of Japan, separated from Honshu and Kyushu by the Seto Inland Sea. People were quite surprised when I told them I was going to Shikoku because it`s known as being quite rural and it`s not on many foreign tourists` itineraries, though I discovered that it is quite popular with Japanese tourists. Spring was the perfect time to go, as the weather was noticeably warmer than Ishikawa, but I can imagine that it would be swelteringly unpleasant in the summer. I knew that Jenny would enjoy the art islands like Naoshima in the Inland Sea, and I had met some people who had cycled around or visited the island and said good things. The more I researched it, the more I wanted to do. I was tempted by the 88 temple pilgrimage that circles the island, the most famous pilgrimage in Japan, that is traditionally done on foot, but unfortunately that takes about two months so we settled for just visiting a few of the temples. Our itinerary was restricted to where the train lines went (our route was a horizontal S-shape from east to west) so we missed out on the very scenic peninsulas to the south of the island, but there was so much to see everywhere else we went that we didn`t mind. Shikoku has art, architecture, history, natural beauty, adventure and great food and drink – what more could you want? Jenny got into Tokyo on a Wednesday which happened to be a national holiday so I was able to take the last two days of the week off and got the night bus to meet her in the morning. We had three days in Tokyo which we spent exploring areas like Ueno, Harajuku and Akihabara and visiting Studio Ghibli and Tokyo Disneyland. We purposefully avoided any temples. We got the night bus from Disneyland to Tokushima on the east side of Shikoku on the Friday night so on Saturday we went to Naruto to see the whirlpools under the bridge and visit the Otsuka Museum that has a reproduction of every major Western work of art (!). The next day we walked the first five temples of the pilgrimage and then got the train up to Takamatsu. 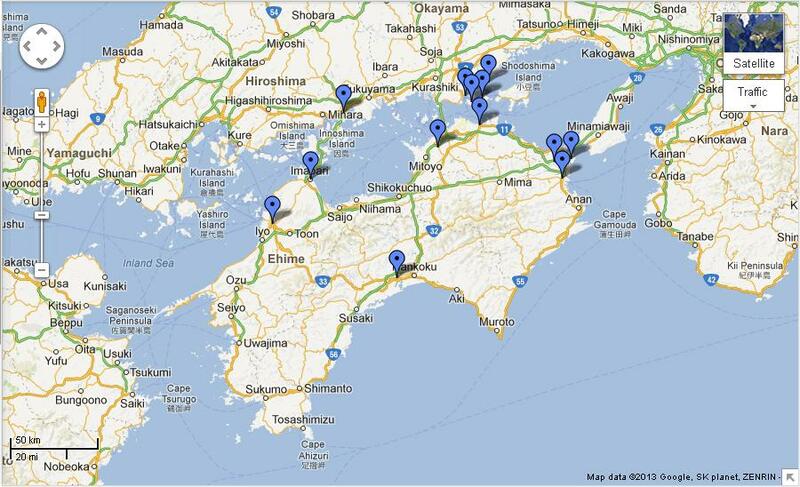 Monday we explored the small art islands of Inujima and Teshima in the Inland Sea and Tuesday we explored Naoshima. Wednesday we visited the garden and castle park in Takamatsu and visited a temple as a stop-off on our train journey down the centre of Shikoku to Kochi. We had to be in Matsuyama in the west on Thursday night so despite having planned to visit a few towns such as Uwajima and Uchiko on the way up, we decided instead to spend the day in Kochi which we had fallen a bit in love with. It was a long train ride to Matsuyama because we took the slow trains the long way around, but it was worth it for the views. In Matsuyama we visited the famous Dogo Onsen and castle and we were very sorry to leave Shikoku, but we did so in style – by bicycle! And on my birthday no less. I had to come back to Kanazawa for work then, while Jenny visited Hiroshima, Okayama and Kyoto, but the adventure isn`t over yet as I`ll be meeting her in Nara for the weekend and then we`ll come back up to Kanazawa. This has just been a quick overview of my trip and I`ll be putting up more detailed posts soon, once I get my photos sorted out.